Come Volunteer with us at a Farmers Market! Are you passionate about reducing carbon emissions and helping people in need? Come Volunteer with ProduceGood and reduce waste and hunger in one sweet step! 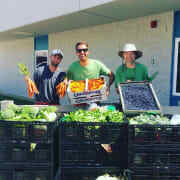 We are a food recovery organization that takes fresh fruits and vegetables that would otherwise be wasted and connect it to the food insecure of San Diego County. Are you SoMe savvy? We need you! Do you love organizing things and spreadsheets? We've got a job for you!!! Put your network to use! Recruit for us! Lead a team at a Farmers Market! Lead a team at one of our backyard Gleans! Some other position? Let me know!!! !